A village in Somerset has unveiled new Dutch-inspired sea defence technology to help protect homes and farms. Stolford, which overlooks the Bristol Channel, flooded in 1981 and 1990, affecting homes and farmland. 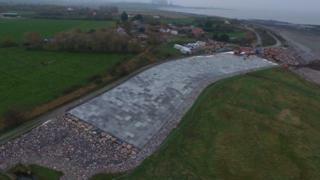 The new £1.5m sea defence replaces a shingle ridge it cost the Environment Agency (EA) £50,000 a year to restore. The agency said it was the first time the design had been used in the UK. Concrete plugs absorb wave power as water flows through the cavities. In 1981 high tides topped sea defences, flooding 660 hectares of land - including 24 homes - and leading to the death of livestock. Another storm and a high tide in 1990 also caused widespread flooding. The "hillblock" design consisting of high-density concrete is commonly used in the Netherlands. Each block is held in place by steel piles and concrete kerbs and can move slightly to better withstand the force of water. The EA said the new defence would protect 20 properties and about 70 hectares of farmland. It is a small section of sea defence which runs between Stolford and nearby Hinkley. John Curtin, executive director of flood and coastal risk management, said: "This is an exciting engineering first for UK - the new technology installed at Stolford can reduce wave energy by up to 30% compared to the shore protection traditionally used. "It will provide valuable protection to this Somerset community and the surrounding agricultural land. The agency added an alternative of rock armour was more expensive and visually intrusive. The scheme was funded by the Wessex Regional Flood and Coastal Committee, EDF Energy and the Dutch government.